The weekly meeting agenda and meeting notes are published on our team page for more detailed insights on our activity. Inspired by the Marketing team, we want to emphasise that all design work for WordPress is done by volunteers. By request of @chanthaboune, we drafted a short summary of what the team’s priority, struggles and focus were for Q1 -2018. After much discussion, we distilled our statement down to this: The design team’s top priority for this year is team building, empowering designers to contribute, and we continue to focus on supporting core. If you want to read what’s behind, follow this link to the Google document we wrote. People contributing to the design team, can get an enterprise license for Invision. We now have 31 people with access, and the first prototypes for Gutenberg are there. We’re still figuring out how to actively start using the license amongst WordPress design contributors. We want to do an online summit for anyone interested in design for WordPress. John Maeda would like to support bringing this together; Tammie Lister walked through some initial ideas for making this happen. The details are still up for discussion, but the basic idea is a summit where anyone can contribute to a specific design goal that the community has agreed on. Join the conversation on our Trello board or add your ideas to our brainstorm document. Lot’s of progress going on on the design for native WordPress plugin headers and icons. Thanks to @cathibosco for breaking this CFD into smaller portions and clarifying what needs to be done. Design eyes are requested for the WordPress dark mode plugin, which now is a plugin, but in the near future hopefully a core feature. More info on the plugin can be found on either Github or Trac. @melchoyce worked on some mockups for improvement of the menu settings page. Extra props for @cathibosco for being engaged with dashicons and plugin icons and making sure these move forward. 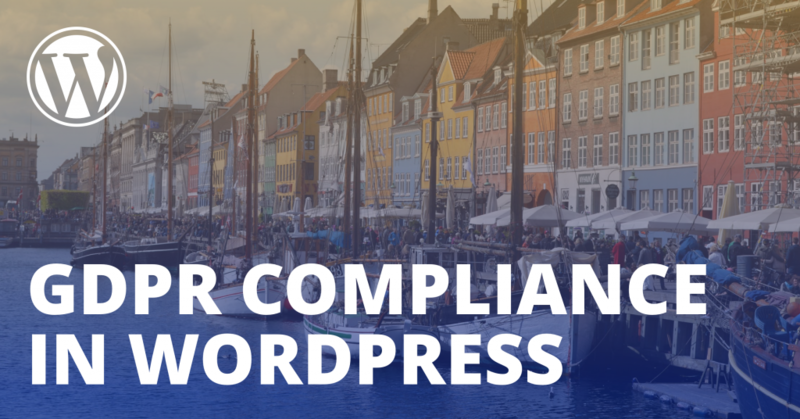 @melchoyce created a featured image for GDPR compliance in WordPress, as requested by the Marketing Team. On a weekly basis, we go over the oldest tickets that need UX/UI feedback to catch up. The goal of these is to look at each one and see if we can progress the issue in some way. Tickets that were discussed this month are: #41191, #43484,#23348, #21603, #37600, #37860, #38315, #38304, #36346, #35538, #35887, #34324, #20846, #16185. On our about page for make.wordpress.org it says “pixel perfect designer.” We discussed that this term is not very inclusive, and that it would be nice if we could convey “design” a little more broadly, since, besides the visual aspect, there’s also UX. After a short discussion, we decided on just ‘designer’ would do for now. New text is available on make.wordpress.org. We’ve also extensively discussed where to collect templates, fonts and other assets we can share for work on WordPress. Now some stuff is stored on Trello, but we agreed this is not the best solution. While we’re exploring setting up a repo for design on Github, the filetypes we can upload to our handbook are now zip, psd, ai, sketch and svg. This means we can add assets to the handbook and keep that as a first to go for designers who want to contribute to the project. To make it easier for new contributors to find out what’s going on, we’ve continued improving our overall structure and communication. This is work in progress. We currently have 3 points of focus: Onboarding, the Handbook and Outreach.